John Wayne Airport is located in Santa Ana, California. It serves the entire Orange County California Area. 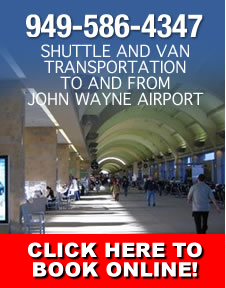 John Wayne Airport Shuttle Association is and organization of shuttle companies operating out of John Wayne Airport. We are a cooperative organization whose members are dedicated to providing first-class customer service to our travelers. Formed on September 8, 1999, John Wayne Airport announced to arriving travelers an exciting new cooperative agreement between the Airport and all of the door-to-door shuttle companies. See the letter from John Wayne Airport to the Shuttle Association below. This program is the first of its kind at John Wayne Airport. The yellow shirt and jacket coordinators employed by various shuttle companies are trained in customer service to assist passengers with ground transportation needs (see Pickup Procedures). Let John Wayne Airport Shuttle Association handle all your Orange County transportation needs. We make is as easy on you as possible. Santa Ana, CA - Beginning today, arriving travelers at John Wayne Airport (JWA) in need of door-to-door shuttle service will be assisted by friendly uniformed Shuttle Coordinators. These individuals are part of an exciting new cooperative agreement between the Airport and all of the door-to-door shuttle companies designed to add to the convenience and ease of using JWA. This Program is the first of its kind at JWA. The objective of the program is to provide Airport patrons with high quality door-to-door shuttle service that enhances their experience at JWA. Shuttle Coordinators, employed by various shuttle companies, have been trained in customer service to assist passengers with ground transportation needs. The traveling public benefits by having readily available a trained person who is dedicated to furnishing information regarding pricing of shuttle service and destination guidance. This program is provided at no additional cost to the public. "The new Door-to-Door Shuttle Coordinator Program complements the Airport���s goal of providing first-class customer service to our travelers," said Loan Leblow, Interim Airport Director. Other services the Shuttle Coordinators provide include general information on ground transportation and Airport related services. Door-to-Door Shuttle Coordinators are available seven days a week from approximately 7 a.m. to 11 p.m. and are stationed in the Ground Transportation Center, located across the roadway from the Thomas F. Riley Terminal. John Wayne Airport Shuttle Association reprensents the shuttle and van drivers operating out of John Wayne Airport in Santa Ana, California. The association serves all of Orange County California specializing the shuttle service to and from Disneyland and the Anaheim Convention Center. �� Copyright 2015-2009. JWA CC Shuttle Association. All rights reserved.